Raise your hand if this made you giggle. Now put your hand down if you’re in the fifth grade. Yup. Just like I thought: many like-minded people here, who find fartleking hilarious. As you should! But what was I saying… oh yes. So I laced up for a run for the first time today this week and thought I’d make it a fun, but also quality one. And you know what’s fun and good for you at the same time? Fartlek. Oh stop! 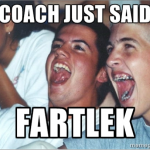 So what is fartlek? In short, it’s interval training with less structure. With speed work – or intervals – you usually have predetermined distances or time periods to go fast, followed by periods of rest (again, specific distance or number of minutes). For example, 6X 800s w/ 200 rest. That means you run 800 meters – twice around a track – as fast as you can, but leave something for the other five times you have to do this; then walk or slowly jog around half of it. Then run fast again, rest; and repeat. With fartlek, you alternate periods of high effort (faster!) with periods of low effort (slower! ), but you don’t have a predetermined distance or time frame over which to do it. Just go with it and have fun. And because there are no distance or time goals to meet, you don’t even have to go to a track to do it. You could fartlek anywhere! And so, as I headed out on my regular four-mile route today, I thought: You know what? It’s been too long since I fartleked. So I got started. I ran the first mile a wee bit faster than my usual warm-up pace: 8:57. Then I picked up the pace for the second mile: 8:07. After that, the plan was to slow down for a bit, only until my heart rate goes down, then pick up the pace again and try to beat my first fast mile, keeping that pace for as long as I could on the way home. But barely a quarter mile into my recovery pace, a major cramp hit. (It was not the feminine kind, I can run through those just fine!) So I slowed down, then slowed down some more. I even had to pause for a few seconds. Get it now? I almost fartleked. Ha! I jogged off the remainder of that mile. Mile 3 pace: 9:21. I even headed out on a shortcut home, thinking I may not make it if I continued on as originally planned. And then something weird happened: I picked up the pace a bit and felt perfectly fine. So I picked it up some more. The moral of this fartlek experience is this: flexibility is a must when you’re training (and even when you’re not). I see this all the time: someone is on a half-marathon or marathon training plan, and for one reason or other can’t make today’s scheduled run. Panic ensues, followed by devising ways to make up for the distance the next day or some time soon. Don’t do that. If you must cancel or cut a run short: do it. Sticking to the program if you’re feeling sick or plain tired isn’t a very good idea. Being flexible – changing your distance or pace – is, even if you have to do it mid-run. The other moral of the story is, of course, that fartlek is fun. And hilarious. And I should go back to the fifth grade because obviously this is where my brain belongs. 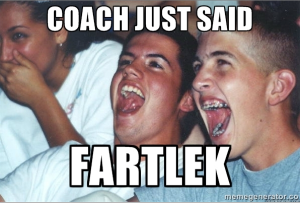 And because I just admitted that openly, here’s my question of the day; feel free to giggle: Do you fartlek?